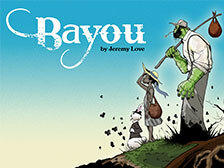 Bayou captures the sense of innocence and wonder of childhood, when magical worlds are just out of the corner of your eye. However this innocence cannot last and the stark horrifying reality of life in the deep south of Jim Crow laws and lynchmobs soon intrude. This story reminds me of Alice Wlakers short story The Flowers as it too captures a feeling of childhood innocence shattered by the discovery of the body of a lynched man. This comic reverse the idea, Lee the title character is searching for the body of a boy accused of ‘whistlin’ at a white woman’. That is not to say that this is simply a tale of black people as victims. Far from it, these characters have a strong sense of self and awareness of a family history of resistance to slavery and hatred. lee encapsulates this in her stubborn refusal to accept that this is the way things are and in her demand for justice. Into this horrifying example of racist hate the author interjects a vision from fairytale. The horror of this story is all the more terrible as we know that racist murders and terrorism like this happened. Juxtaposing this bleak reality with a fairytale world full of wonder and a fair amount of horror of its own is an incredibly effective technique.